There are several calorie counters apps available for Android, free ad-supported, and paid. Loading a diet app on your Android is the easiest part of losing weight. Establishing a new healthy lifestyle and achieving permanent weight loss is more difficult. You need to find a proven, solid program that works well. Something that is easy, takes the minimum of your time, something that you can use every day and will not give up. Healthy weight loss does take time. MyNetDiary is the first and only professional, uncompromising, high-quality diet app for Android. It is built following our highly successful, top-of-the-line iPhone and iPad apps, taking no shortcuts. Everything our users love in the iPhone app is available on Android. And we made every effort to make MyNetDiary a pleasure to use every day. Calorie Counter PRO by MyNetDiary is available on Google Play and other Android stores. This app does not have any ads. Get the app from Google Play or simply search for MyNetDiary in the app store on your phone! MyNetDiary is the only Instant Calorie Counter - like Google Instant, pushing what's possible to the limit - searching while you type, predicting your entries, and correcting your typos. There is no faster way to enter daily foods than with MyNetDiary, saving you 5-12 minutes every day, helping you to stick to your diet plan. 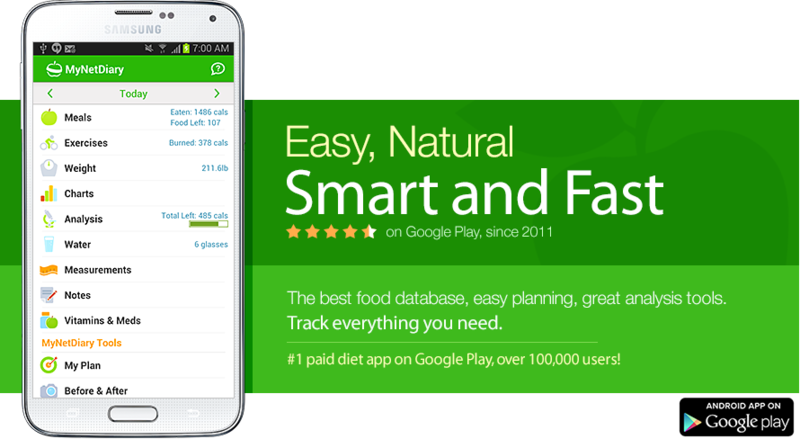 Fast and easy food entry is crucial for any diet app, and we are proud that MyNetDiary is the number one in speed and ease of use. With 716,000 foods entered by us and growing weekly, you rarely need to enter food labels. Equally important, MyNetDiary database is accurate and up-to-date, without duplicates. We have a great team working on food research every day - if some foods are not yet in our database, let us know and if this information is available from the vendor, we will enter food labels for you. We call it Continuous Food Research process. In addition, we have over 263,000 foods contributed by our members, covering other popular and ethnic foods. Overall, there are 979,000 foods in MyNetDiary database! There are many more charts in MyNetDiary – helping you visualize and compare with plan your macronutrient balance (in grams, calories, and percentages), and see your calorie deficit. And now, as many of our members use Android smartphones, we created an Android app to help you keep your diary on the go. The Android app is the pinnacle of our service, implementing everything we've learned with the iPhone, without compromises. It is as advanced in every aspect as our leading, state-of-the-art iPhone app, handpicked by Apple as an App Store Essential for “Get in Shape”. MyNetDiary for Android has everything - up to 45 nutrients, all body measurements, recipes, favorites, exercise, diet planning, US and metric system, many charts, reports, food time tracking, barcode scanner, and much more. Everything you miss in other calorie counters is available in MyNetDiary and, as always, it is very easy to use. Did we mention that there are no ads in the app? We all love our smartphones and rely on them every day. But healthy weight loss takes time, and similarly to e-mail, you may want to use the comfort of your computer, with its large screen and keyboard - when you are home or at the office. With MyNetDiary you have the flexibility of keeping your diary on a state-of-the-art web site, or your Android. The web site and your Android are always in perfect sync. Do you have an Android phone? Calorie Counter PRO by MyNetDiary is available on Google Play and other Android stores. This app does not have any ads. Get the app from Google Play or simply search for MyNetDiary in the app store on your phone! No Android phone yet? Sign Up for MyNetDiary.com and start losing weight online. You'll be able to sync your diary when you get your Android phone.